"Stay with Me" is a song by English singer Sam Smith from his debut studio album In the Lonely Hour (2014). It was released in the United States on 14 April 2014 and in the United Kingdom on 18 May 2014. "Stay with Me" is a gospel-inspired ballad that details the protagonist pleading with his one-night stand not to leave him. The song was written by Smith, James Napier, and William Phillips, with Tom Petty and Jeff Lynne later receiving co-writer credits due to the song's noted melodic similarity to Petty's single "I Won't Back Down". In January 2015, it was revealed that a settlement had been reached with Tom Petty's publishing company to add Petty and Jeff Lynne as co-writers, and that they would receive a 12.5% songwriting credit. Petty's publisher contacted Smith's team after it noticed a likeness between "Stay with Me" and the melody of Petty's 1989 song "I Won't Back Down". Petty clarified that he did not believe Smith plagiarized him, saying "All my years of songwriting have shown me these things can happen. Most times you catch it before it gets out the studio door but in this case it got by. Sam's people were very understanding of our predicament and we easily came to an agreement." According to Smith, he had never heard "I Won't Back Down" before he wrote "Stay with Me", but he acknowledged the similarity after listening to the song, and said that the likeness was "a complete coincidence". Petty and Lynne, however, were not eligible for a Grammy as the Recording Academy considered "Stay with Me" to have been interpolated from "I Won't Back Down" by Napier, Phillips and Smith; instead Petty and Lynne would be given certificates to honor their contribution to the work, as is usual for writers of sampled or interpolated work. "Stay with Me" was written by Smith, James Napier, William Phillips, with additional credits to Tom Petty and Jeff Lynne. According to the sheet music published at Musicnotes.com by Sony/ATV Music Publishing, the song is set in the key of C major in common time with a tempo of 84 beats per minute. Smith's vocals span two octaves from E3 to E5 while the song follows a chord progression of Am7–F–C. According to Erine Keane of Salon, "Stay with Me" combines a "contemporary drumbeat", blue-eyed soul singing, and a refrain sung in a gospel style, while Stereogum's Tom Breihan called it "a soft-focus piano-soul ballad". In the UK Singles Chart it debuted at number 1, making it Smith's third number one. The song became the eighth best-selling song of 2014 in the UK, and the seventh overall when streaming is included. On the Billboard Hot 100, the song peaked at number 2 for two weeks, making it Smith's first top ten song in the US as a lead artist and his highest charting single to date. It was held off from the top spot by MAGIC! 's "Rude." As of the week of 2 May 2015, "Stay with Me" has spent 21 weeks in the top ten and 54 weeks on the Hot 100. The song was the tenth best-selling song of 2014 in the United States with 3.34 million copies sold in that year. As of June 2015, The song has sold 4.1 million copies in the US. In Canada, "Stay with Me" topped the Canadian Hot 100 for seven consecutive weeks. In Australia, the song debuted at number 22 on the ARIA Singles Chart on the chart dated 5 May 2014 and later peaked at number 5 on the chart date 16 June 2014. The song also reached top 10 status in over twelve countries worldwide, becoming Smith's most successful single to date. A music video to accompany the release of "Stay with Me" was first released onto YouTube on 27 March 2014 at a total length of three minutes and twenty-nine seconds. The video shows Smith coming out of a house and walking down a street in De Beauvoir Town, London, sitting in a room performing the song, and performing the song in a church with a choir. It was directed by Jamie Thraves. "Stay with Me" received nominations at the MTV Video Music Awards for Best Male Video and Artist to Watch. In June 2014, Ed Sheeran covered "Stay with Me" at BBC Radio 1's Live Lounge. He explained his choice saying "It's my favorite song of the last year. I think it’s an instant classic." Florence and the Machine covered it at the Orange Warsaw Festival. In July, Vin Diesel sang it during an interview with Capital FM. In August, Chris Brown posted a video on Instagram in which he sings the song with lyric changes. Eventual winner Josh Kaufman covered the song for his top 12 performance on the sixth season of The Voice US. Reigan Derry performed the song for "Top 10 Hits" themed week on the sixth series of The X Factor Australia, and her performance debuted at number 20 on the ARIA Singles Chart. In September 2014, FKA twigs also covered it at BBC Radio 1's Live Lounge. Also in September, Charli XCX covered it at Live 95.5's Bing Lounge. Luke James also covered the song, which appeared on his 2014 self-titled album. Kelly Clarkson covered the song at her free concert in honor of the new Microsoft store at the SouthPark Mall in Charlotte, North Carolina. Singer Patti LaBelle performed it in November 2014 on her concert tour. Romain Virgo did a reggae cover. In September 2017, Pink covered "Stay with Me" at BBC Radio 1's Live Lounge. In November 2017, American country singer Coffey Anderson released it as part of his Sad Love Songs series accompanied by a music video directed by Terry W.
Actor Marlon Wayans lip synced this song on the show Lip Sync Battle. The song is played in the emotional scene where Mary, Queen of Scots (Adelaide Kane) and a dying Francis II of France (Toby Regbo) dance together in the television show Reign. In the 2016 animated film Sing, Johnny (voiced by Taron Egerton) sings this song as his audition for the singing competition. The song is also used as the background music for the Inspiron 17 5000 commercial, with Liev Schreiber and Chris Pratt. ^ Ollman, Jonah (28 March 2014). "The Angel of Cambridge: Sam Smith". Sound of Boston. Retrieved 29 March 2014. ^ "Grammy Awards: Sam Smith wins four prizes". BBC. 9 February 2015. ^ "Sam Smith's 'Stay with Me' Vs. 'Stay with Me (Darkchild Version)': What's the Difference?". Radio.com. 5 December 2014. ^ a b c "Sam Smith On The Story Behind 'Stay With Me' video". NME. ^ Shawn Christ (8 September 2014). "Sam Smith Talks About Creating 'Stay With Me'". Music Times. ^ Marlow Stern (9 February 2015). "Sam Smith's 'Stay With Me' Inspiration: 'A Guy That I Fell In Love With Last Year". The Daily Beast. ^ Taylor, Frances (25 March 2014). "Sam Smith premieres new track - listen". Digital Spy. ^ Sam Smith [@samsmithworld] (21 March 2014). "WHO'S READY FOR MY SECOND SINGLE? ..." (Tweet). Retrieved 28 October 2014 – via Twitter. ^ "Listen: Sam Smith's beautiful new single "Stay with Me"". Consequence of Sound. ^ "Sam Smith: Tom Petty given writing credit for Stay with Me". BBC News. 27 January 2015. ^ Kreps, Daniel (29 January 2015). "Tom Petty on Sam Smith Settlement: 'No Hard Feelings. These Things Happen'". Rolling Stone. Retrieved 31 January 2015. ^ "Sam Smith explains why he settled copyright dispute with Tom Petty". CBC. 7 February 2015. ^ Lac, J. Freedom du; Lac, J. Freedom du (9 February 2015). "The only person Sam Smith didn't thank at the Grammys deserves a lot of credit" – via washingtonpost.com. ^ Copland, Chris (25 January 2015). "Tom Petty awarded songwriting royalties for Sam Smith's "Stay With Me"". Consequence of Sound. Retrieved 26 January 2015. ^ "Sam Smith: Tom Petty given writing credit for Stay With Me". BBC. 27 January 2015. Retrieved 27 January 2015. ^ Randall Roberts (26 January 2014). "Tom Petty, Jeff Lynne added to credits of Sam Smith's 'Stay With Me'". Los Angeles Times. ^ "Musicnotes.com: Unsupported Browser or Operating System". Retrieved 28 October 2014. ^ Keane, Erin (5 December 2014). "Beyoncé gets snubbed: This morning's bizarre Grammys announcements". Salon. Retrieved 20 January 2015. ^ Breihan, Tom (22 May 2014). "Sam Smith – 'Leave Your Lover' Video". Stereogum. Retrieved 20 January 2015. ^ "Sam Smith 'Stay with Me' - Single review". digitalspy.com. 19 May 2014. Retrieved 9 June 2014. ^ "Sam Smith "Stay With Me"". rollingstone.com. 4 April 2014. Retrieved 9 June 2014. ^ "Album Review: Sam Smith – In The Lonely Hour". nouse.com. 1 June 2014. Retrieved 9 June 2014. ^ "Sam Smith – In the Lonely Hour | Album review". theupcoming.co.uk. 31 May 2014. Retrieved 9 June 2014. ^ "10 Best Songs of 2014 (So Far): Critics' Picks". 10 July 2014. Retrieved 11 July 2014. ^ "Readers Select 2014 Songs of Summer". 12 August 2014. Retrieved 13 August 2014. ^ "50 Best Songs of 2014". 3 December 2014. Retrieved 4 December 2014. ^ Copsey, Rob (1 January 2014). "The Official Top 40 Biggest Selling Singles of 2014". Official Charts Company. Retrieved 1 January 2015. ^ Copsey, Rob (31 December 2014). "The Official Top 100 Biggest Songs of 2014 revealed". Official Charts Company. ^ Paul Grein (31 December 2014). "It's Official: Pharrell Has 2014's Best-Selling Song". Yahoo! Music. ^ Caulfield, Keith (26 June 2015). "Billboard 200 Chart Moves: Alanis Morissette's 'Jagged Little Pill' Hits 15 Million in U.S. Sales". Billboard. Prometheus Global Media. Retrieved 26 June 2015. ^ Hung, Steffen. "australian-charts.com - Sam Smith - Stay With Me". www.australian-charts.com. Retrieved 24 January 2016. ^ SamSmithWorldVEVO (27 March 2014). "Sam Smith - Stay With Me" – via YouTube. ^ "Sam Smith - Stay With Me (Behind the Scenes Video)". YouTube. Retrieved 28 October 2014. ^ Gallo, Phil (17 July 2014). "Beyoncé Leads MTV VMAs With 8 Nominations". Billboard. Retrieved 17 July 2014. ^ Daw, Robbie (5 June 2014). "Ed Sheeran Covers Sam Smith's "Stay With Me" & Performs "Sing" For BBC Radio 1 Live Lounge: Watch". Idolator. Buzz Media. Retrieved 24 July 2014. ^ Graves, Shahlin (17 June 2014). "FLORENCE + THE MACHINE covering Sam Smith's 'Stay With Me'". Coupdemainmagazine. Archived from the original on 8 August 2014. Retrieved 31 July 2014. ^ "Sam Smith Reacts! See What He Thought Of Vin Diesel's Exclusive 'Stay With Me' Cover". Capital FM. 31 July 2014. Retrieved 31 July 2014. ^ Platon, Adelle (14 August 2014). "Watch: Chris Brown Gives Sam Smith's 'Stay With Me' A Lyrical Twist". Vibe. Retrieved 16 August 2014. ^ Ryan, Gavin (6 September 2014). "Taylor Swift's Shake It Off Still Number 1 on ARIA Singles Chart". Noise11. Noise Network. Retrieved 6 September 2014. ^ "FKA twigs Covers Sam Smith's "Stay With Me"". Pitchfork. Retrieved 28 October 2014. ^ "Charli XCX - 'Stay With Me' (Sam Smith cover) - New Music - The 405". The 405. Retrieved 28 October 2014. ^ "Stay With Me (Luke James vocal cover)". SoundCloud. Retrieved 28 October 2014. ^ "Kelly Clarkson Covers Sam Smith's Stay With Me at First Solo Concert Since Giving Birth - E! Online". E! Online. 20 October 2014. Retrieved 28 October 2014. ^ Joey Mannarino (29 November 2014). "Patti LaBelle covers Sam Smith's Grammy Award Winning, "Stay With Me" (Record/Song Of The Year)" – via YouTube. ^ "Romain Virgo - Stay With Me (Reggae Cover)". YouTube. ^ "Sad Love Songs - Stay With Me - Coffey Anderson". YouTube. 29 November 2017. Retrieved 19 December 2017. ^ "Sam Smith Stuns VMAs With Gorgeous, No Frills Performance". Billboard. Retrieved 26 August 2014. ^ "Sam Smith - Stay With Me (Live) ft. Mary J. Blige". YouTube. Retrieved 28 October 2014. ^ a b "Stay With Me (feat. Mary J. Blige) – Single by Sam Smith". iTunes Store. United States: Apple. Retrieved 3 June 2014. ^ a b "Stay With Me – EP by Sam Smith". iTunes Store. United Kingdom: Apple. Retrieved 28 October 2014. ^ "Australian-charts.com – Sam Smith – Stay with Me". ARIA Top 50 Singles. Retrieved 5 May 2014. ^ "Austriancharts.at – Sam Smith – Stay with Me" (in German). Ö3 Austria Top 40. Retrieved 10 November 2014. ^ "Ultratop.be – Sam Smith – Stay with Me" (in Dutch). Ultratop 50. Retrieved 10 November 2014. ^ "Ultratop.be – Sam Smith – Stay with Me" (in Dutch). Ultratop Dance. Retrieved 10 November 2014. ^ "Ultratop.be – Sam Smith – Stay with Me" (in French). Ultratop 50. Retrieved 10 November 2014. ^ "Ultratop.be – Sam Smith – Stay with Me" (in French). Ultratop Dance. Retrieved 10 November 2014. ^ "Top 100 Billboard Brasil – weekly". Billboard Brasil. 15 November 2014. Archived from the original on 29 November 2014. Retrieved 11 November 2014. ^ "Sam Smith Chart History (Canadian Hot 100)". Billboard. Retrieved 10 November 2014. ^ "Sam Smith Chart History (Canada AC)". Billboard. Retrieved 5 February 2015. ^ "Sam Smith Chart History (Canada CHR/Top 40)". Billboard. Retrieved 5 February 2015. ^ "Sam Smith Chart History (Canada Hot AC)". Billboard. Retrieved 5 February 2015. ^ "Sam Smith Chart History (Canada Rock)". Billboard. Retrieved 5 February 2015. ^ "ČNS IFPI" (in Czech). Hitparáda – Radio Top 100 Oficiální. IFPI Czech Republic. Note: Change the chart to CZ – RADIO – TOP 100 and insert 201428 into search. Retrieved 19 August 2014. ^ "ČNS IFPI" (in Czech). Hitparáda – Digital Top 100 Oficiální. IFPI Czech Republic. Note: Change the chart to CZ – SINGLES DIGITAL – TOP 100 and insert 201450 into search. Retrieved 19 August 2014. ^ "Danishcharts.com – Sam Smith – Stay with Me". Tracklisten. Retrieved 10 November 2014. ^ "Euro Digital Songs". Billboard. Retrieved 7 June 2014. ^ "Sam Smith: Stay with Me" (in Finnish). Musiikkituottajat – IFPI Finland. Retrieved 10 November 2014. ^ "Lescharts.com – Sam Smith – Stay with Me" (in French). Les classement single. Retrieved 10 November 2014. ^ "Offiziellecharts.de – Sam Smith – Stay with Me". GfK Entertainment Charts. Retrieved 10 November 2014. ^ "Greece Digital Songs". Billboard. Retrieved 7 September 2017. ^ "Archívum – Slágerlisták – MAHASZ" (in Hungarian). Single (track) Top 40 lista. Magyar Hanglemezkiadók Szövetsége. Retrieved 19 February 2015. ^ "Archívum – Slágerlisták – MAHASZ" (in Hungarian). Stream Top 40 slágerlista. Magyar Hanglemezkiadók Szövetsége. Retrieved 7 September 2017. ^ "Sam Smith & Mary J. Blige Chart History". RÚV. Retrieved 26 June 2018. ^ "Chart Track: Week 21, 2014". Irish Singles Chart. Retrieved 10 November 2014. ^ "Sam Smith – Stay With Me Media Forest". Israeli Airplay Chart. Media Forest. Retrieved 13 July 2014. ^ "Italiancharts.com – Sam Smith – Stay with Me". Top Digital Download. Retrieved 10 November 2014. ^ "Sam Smith Chart History (Japan Hot 100)". Billboard. Retrieved 7 September 2017. ^ "Luxembourg Digital Songs". Billboard. Retrieved 7 September 2017. ^ "Mexico Ingles Airplay". Billboard. Retrieved 7 September 2017. ^ "Nederlandse Top 40 – week 34, 2014" (in Dutch). Dutch Top 40 Retrieved 10 November 2014. ^ "Dutchcharts.nl – Sam Smith – Stay with Me" (in Dutch). Single Top 100. Retrieved 10 November 2014. ^ "Charts.nz – Sam Smith – Stay with Me". Top 40 Singles. Retrieved 10 November 2014. ^ "Norwegiancharts.com – Sam Smith – Stay with Me". VG-lista. Retrieved 10 November 2014. ^ "Listy bestsellerów, wyróżnienia :: Związek Producentów Audio-Video". Polish Airplay Top 100. Retrieved 1 September 2014. ^ "Portugal Digital Songs". Billboard. Retrieved 7 September 2017. ^ "Official Scottish Singles Sales Chart Top 100". Official Charts Company. Retrieved 10 November 2014. ^ "ČNS IFPI" (in Slovak). Hitparáda – Radio Top 100 Oficiálna. IFPI Czech Republic. Note: insert 201445 into search. Retrieved 10 November 2014. ^ "ČNS IFPI" (in Slovak). Hitparáda – Singles Digital Top 100 Oficiálna. IFPI Czech Republic. Note: Select SINGLES DIGITAL - TOP 100 and insert 201446 into search. Retrieved 13 September 2014. ^ "SloTop50: Slovenian official singles weekly chart" (in Slovenian). SloTop50. Retrieved 31 August 2014. ^ "EMA Top 10 Airplay: Week Ending 2014-08-19". Entertainment Monitoring Africa. Retrieved 16 September 2015. ^ "Spanishcharts.com – Sam Smith – Stay With Me" Canciones Top 50. Retrieved 11 November 2014. ^ "Swedishcharts.com – Sam Smith – Stay with Me". Singles Top 100. Retrieved 10 November 2014. ^ "Swisscharts.com – Sam Smith – Stay with Me". Swiss Singles Chart. Retrieved 10 November 2014. ^ "Official Singles Chart Top 100". Official Charts Company. Retrieved 10 November 2014. ^ "Sam Smith Chart History (Hot 100)". Billboard. Retrieved 10 November 2014. ^ "Sam Smith Chart History (Adult Contemporary)". Billboard. Retrieved 10 November 2014. ^ "Sam Smith Chart History (Adult Pop Songs)". Billboard. Retrieved 10 November 2014. ^ "Sam Smith Chart History (Dance Mix/Show Airplay)". Billboard. Retrieved 7 September 2017. ^ "Sam Smith Chart History (Dance Club Songs)". Billboard. Retrieved 10 November 2014. ^ "Sam Smith Chart History (Pop Songs)". Billboard. Retrieved 10 November 2014. ^ "Sam Smith Chart History (Hot R&B/Hip-Hop Airplay)". Billboard. Retrieved 19 October 2014. ^ "Sam Smith Chart History (Rhythmic)". Billboard. Retrieved 10 November 2014. ^ "Sam Smith Chart History (Rock Airplay)". Billboard. Retrieved 10 November 2014. ^ "End of Year Charts – ARIA Top 100 Singles 2014". Australian Recording Industry Association. Retrieved 1 February 2015. ^ "Jahreshitparade Singles 2014" (in German). Austrian Charts Portal. Hung Medien. Retrieved 5 January 2016. ^ "Jaaroverzichten 2014" (in Dutch). Ultratop & Hung Medien. Retrieved 21 March 2016. ^ "Rapports annuels 2014" (in French). Ultratop. Retrieved 21 March 2016. ^ "Canadian Hot 100: Year End 2014". Billboard. Retrieved 21 December 2014. ^ "Classement Singles - année 2014" (in French). infodisc.fr. Retrieved 7 September 2017. ^ "Top 100 Single-Jahrescharts" (in German). GfK Entertainment Charts. Retrieved 10 August 2015. ^ "MAHASZ Stream TOP 100 - 2014" (in Hungarian). Association of Hungarian Record Companies. Retrieved 7 September 2017. ^ "IRMA - Best of Singles". IRMA Charts. Irish Record Music Association. Retrieved 30 December 2014. ^ "FIMI - Classifiche Annuali 2014 "TOP OF THE MUSIC" FIMI-GfK: un anno di musica italiana" (in Italian). Federazione Industria Musicale Italiana. Archived from the original on 13 January 2015. Retrieved 19 January 2015. ^ "Jaarlijsten 2014" (in Dutch). Stichting Nederlandse Top 40. Retrieved 7 September 2017. ^ "Jaaroverzichten - Single 2014". Hung Medien. Retrieved 7 September 2017. ^ "Topp 20 Single Sommer 2014" (in Norwegian). VG-lista. Retrieved 7 September 2017. ^ "SloTop50 | Slovenian official year-end singles charts" (in Slovenian). Retrieved 31 January 2018. ^ a b "Top 100 Streaming 2014". Productores de Música de España. Retrieved 8 September 2017. ^ "Årslista Singlar – År 2014" (in Swedish). Sverigetopplistan. Swedish Recording Industry Association. Retrieved 7 September 2017. ^ "Swiss Year-end Charts 2014". Hung Medien. Retrieved 7 September 2017. ^ "End of Year Singles Chart Top 100 - 2014". Official Charts Company. Retrieved 7 September 2017. ^ "Adult Alternative Songs: Year End 2014". Billboard. Retrieved 21 December 2014. ^ "Adult Contemporary Songs Year End 2014". Billboard. Retrieved 7 September 2017. ^ "Adult Pop Songs Year End 2014". Billboard. Retrieved 7 September 2017. ^ "Dance/Mix Show Songs Year End 2014". Billboard. Retrieved 7 September 2017. ^ "Pop Songs Year End 2014". Billboard. Retrieved 7 September 2017. ^ "Rhythmic Songs Year End 2014". Billboard. Retrieved 7 September 2017. ^ "ARIA Charts - End of Year Charts - Top 100 Singles 2015". Australian Recording Industry Association. Retrieved 6 January 2016. ^ "Jaaroverzichten 2015" (in Dutch). Ultratop & Hung Medien. Retrieved 21 March 2016. ^ "Rapports annuels 2015" (in French). Ultratop. Retrieved 21 March 2016. ^ "Track Top-100, 2015". Hitlisten.NU. Retrieved 7 September 2017. ^ "Classement Singles - année 2015" (in French). infodisc.fr. Retrieved 7 September 2017. ^ "Classifiche "Top of the Music" 2015 FIMI-GfK: La musica italiana in vetta negli album e nei singoli digitali" (in Italian). Federazione Industria Musicale Italiana. Retrieved 13 January 2016. ^ "Japan Hot 100 Year End 2015". Billboard. Retrieved 7 September 2017. ^ "Jaarlijsten 2015" (in Dutch). Stichting Nederlandse Top 40. Retrieved 7 September 2017. ^ "Jaaroverzichten - Single 2015". Hung Medien. Retrieved 7 September 2017. ^ "Top 100 Canciones Anual 2015". Productores de Música de España. Retrieved 7 September 2017. ^ "Årslista Singlar – År 2015" (in Swedish). Sverigetopplistan. Swedish Recording Industry Association. Retrieved 21 March 2016. ^ "Swiss Year-end Charts 2015". Hung Medien. Retrieved 7 September 2017. ^ "End of Year Singles Chart Top 100 – 2015". Official Charts Company. Retrieved 10 January 2016. ^ "Hot 100: Year End 2015". Billboard. Retrieved 23 December 2015. ^ "Adult Contemporary Songs Year End 2015". Billboard. Retrieved 7 September 2017. ^ "ARIA Charts – Accreditations – 2015 Singles". Australian Recording Industry Association. Retrieved 2 October 2014. ^ "Austrian single certifications – Sam Smith – Stay With Me" (in German). IFPI Austria. Retrieved 17 March 2015. Enter Sam Smith in the field Interpret. Enter Stay With Me in the field Titel. Select single in the field Format. Click Suchen. ^ "Ultratop − Goud en Platina – singles 2015". Ultratop. Hung Medien. Retrieved 2 October 2015. ^ Bliss, Karen (27 January 2015). "Nielsen: Canada Loved Taylor Swift, Streaming Music and, Yep, Vinyl in 2014". Billboard. Retrieved 30 January 2015. ^ "Canadian single certifications – Sam Smith – Stay With Me". Music Canada. Retrieved 30 January 2015. ^ "Certificeringer - Sam Smith - Stay with Me" (in Danish). IFPI Denmark. Retrieved 7 September 2017. ^ "Gold-/Platin-Datenbank (Sam Smith; 'Stay With Me')" (in German). Bundesverband Musikindustrie. Retrieved 28 April 2018. ^ "Italian single certifications – Sam Smith – Stay with Me" (in Italian). Federazione Industria Musicale Italiana. Retrieved 5 March 2018. Select "2018" in the "Anno" drop-down menu. Select "Stay with Me" in the "Filtra" field. Select "Singoli online" under "Sezione". ^ "Sam Smith - Stay With Me" (in Dutch). RTL Boulevard. Retrieved 8 September 2017. 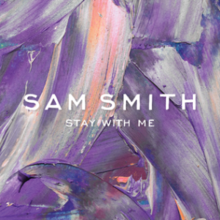 ^ "Norwegian single certifications – Sam Smith – Stay with Me" (in Norwegian). IFPI Norway. Retrieved 3 October 2014. ^ "Canción Stay With Me". Productores de Música de España. Retrieved 28 December 2018. ^ "Sam Smith - Stay With Me" (in Swedish). Grammofon Leverantörernas Förening. Retrieved 8 September 2017. ^ "The Official Swiss Charts and Music Community: Awards (Sam Smith; 'Stay with Me')". IFPI Switzerland. Hung Medien. Retrieved 6 April 2015. ^ Rob Copsey (19 September 2017). "The UK's Official Chart 'millionaires' revealed". Official Charts Company. Retrieved 20 September 2017. ^ "British single certifications – Sam Smith – Stay with Me". British Phonographic Industry. Select singles in the Format field. Select Platinum in the Certification field. Type Stay with Me in the "Search BPI Awards" field and then press Enter. ^ "American single certifications – Sam Smith – Stay with Me". Recording Industry Association of America. Retrieved 14 August 2018. If necessary, click Advanced, then click Format, then select Single, then click SEARCH. ^ "Certificeringer - Sam Smith - Stay With Me" (in Danish). IFPI Denmark. Retrieved 22 October 2014. ^ "Future Releases on Triple A (AAA) Radio Stations". All Access Music Group. Archived from the original on 13 April 2014. ^ "Hot/Modern/AC Future Releases". All Access Music Group. Archived from the original on 13 April 2014. ^ "Top 40/M Future Releases". All Access Music Group. Archived from the original on 12 May 2014. Awards for "Stay with Me"
This page was last edited on 24 April 2019, at 08:54 (UTC).